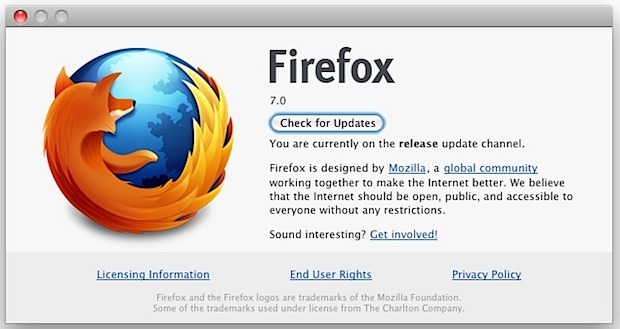 Firefox 7 is now available to download for all supported platforms, the new release has an emphasis on improved memory management and speed, and it does provide a noticeable difference in snappiness when loading pages or browsing the web. The benefits are best seen if you keep Firefox open for a long time (who ever closes their web browser anyway? ), use a lot of tabs, and view pages with a lot of images or text, and in my usage I can confirm it feels more responsive and has a lower memory footprint in OS X. The Mozilla dev team suggests that version 7 will use as much as 50% less memory, but I haven’t seen that dramatic of a difference. If you use Firefox for any browsing purposes or rely on it for plugins like Firebug, it’s well worth downloading. As usual, Mac OS X, Windows, and Linux are available concurrently. If you have plugins installed, expect a few to nag about compatibility, but they all worked for me anyway. I’m getting 20k/sec from their crappy mirrors, they should have just mirrored it on Amazon S3. Any comparisons against Chrome yet? I miss my addons in FF tab mix plus for sure. Chrome is now the slowest of the big four browsers – see Lifehacker’s latest comparitive benchmarks. Still no Lion features, yet…hmm…that’s one thing I’ve really enjoyed about the Chrome beta. They jumped right on Lion with full screen browsing, two finger navigation, elastic scrolling, disappearing scrollbars…I realize not all the Lion changes are real useful, but at least they’re trying to stay recent. Firefox has had all these features and more (twist to change tabs, pinch to close tab, rev pinch to open tab) since Snow Leopard (except disappearing scrollbars). I might start using it again, if it stops hanging when I try to access bookmarks. Firefox is so much slower than Opera, that it really is unimpressive. After I open a third tab the spinning wheel on the tab looks like it is struggling to make something happen. Then there’s something wrong with your setup. You’re probably right my system is slow; I have an i5, 2.7 GHZ iMac with only …….16GB of Ram:) Opera blows Firefox out of the water. Though, it is true patience is a virtue. all right, all right, we’re impressed, but don’t get snarky…..
Just downloaded this update…definitely seems faster than Firefox 6. I even had the Firefox 7.0 beta and this seems much faster when loading webpages. Less memory? Three tabs open (Gmail, Google Searcher, and ArsTechncia) 764 MB and that does not include the plugin processes like craptastic Flash, et cetera. Horrible bloatware IMO. Plugins are to blame by the sound of it. That or just get more RAM and quit whining. meh.. i’ll wait til next week for FireFox 8. Actually, memory use went up with 7.0 over 6.0.2 quite a bit. Almost 2 times. I wish there was a comparison from LH on OSX. with firefox 7 i get messages about excessive me mory usage i never got before with previous versions of firefox.